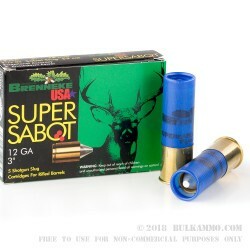 This 12 Gauge shell by Brenneke USA is loaded with the manufacturer’s proprietary 1 ⅛ ounce SuperSabot slug. 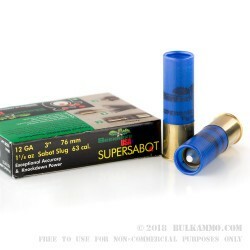 The SuperSabot slug provides controlled expansion via its aluminum tip and its brass core and jacket, and its accuracy up to distances of 110 yards makes it ideal for hunting in areas where a rifle bullet would pose too great a risk of traveling into nearby populated areas. 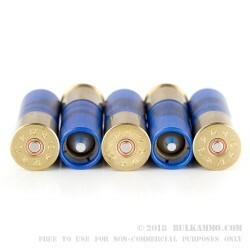 The lead-free SuperSabot slug is optimized for use with a rifled shotgun barrel, as it is designed to engage with the rifling to provide a ballistic spin, but it may be fired from a smoothbore barrel provided it is not fitted with a muzzle choke. The slug’s passage through the barrel is facilitated by the plastic carcass that envelops it, which opens and detaches once the slug has left the muzzle at a velocity of 1,526 fps.